Milan’s Defeat To Juventus Confirms Urgency To Invest – AC Milan Bros.
On Saturday, Milan fell to the Bianconeri 1-0 at a crowded Juventus Stadium. Argentina forward Paulo Dybala broke the deadlock in the second half with a left-footed goal past the diving 16-year old keeper Gianluigi Donnarumma. With this result, and after an overall look at the current setup of Siniša Mihajlović’s squad, it’s clear that the Rossoneri are in need of revamping come January when the next transfer window is open for business around Europe. Mihajlović has done a fairly good job being able to overcome injuries this season as some of the others on the bench have stepped up to produce. However, the recent injury bug along with the lingering fitness issues of some of the current squad members has been detrimental to any further form the former Sampdoria manager seeks from his men. In the tough defeat at the hands of Massimiliano Allegri and his Juventus side, these two concerns were exploited and ultimately, swung the outcome of the match in favour of the Old Lady. The Rossoneri were without Andrea Bertolacci and Mario Balotelli who both seemed to be finding their rhythm prior to being put on the shelf indefinitely. This season, we have seen an improved defense under Mihajlović and against Juventus, this held up. Donnarumma remained confident in goal despite the attention surrounding “Gigio versus Gigi” headlines that crowded newspapers in Italy. The back-four remained organized, unafraid and controlled for nearly the entire match. However, we wish we could say the same for the consistently inconsistent midfield. The trio of Kucka, Montolivo and Bonaventura simply did not do enough to create anything nor attempt to pressure the opposition. A bit of a decent counter attacking buildup here and there but ultimately, the opposition’s midfield was much more influential (and much more talented). It’s unfair to legitimately compare the two when Milan are continually shuffling their lineup week in and week out. Claudio Marchisio and Paul Pogba are two of the best midfielders in not just Italy, but Europe. Their presence is felt regularly, even if they don’t have the best of showings. 102/123 (83%) of passes completed by the midfield. A serviceable conversion right? But very few were forward or allowed Carlos Bacca, M’Baye Niang or Alessio Cerci to push in on goal. They are lacking that clinical pass and linking of play to deliver consistent opportunities which is a concern, especially against clubs as organized as Juventus. Bonaventura was moved into the midfield from the left-wing position in order to fill the void left by the injured Bertolacci. While it filled the gap, it also forced Mihajlović to take one of his best players in Jack out of a comfortable spot, replacing him with Niang. For Cerci, we’ve seen some improved play in recent weeks, yet he looks predictable. Unwilling to take on defenders. Against Juventus, he tried to pressure Patrice Evra and then eventually Alex Sandro. But the left-footed winger appeared to shy away from using his right and smart players like Evra and Sandro will surely pick up on those weaknesses and exploit them. His missed header just a few yards out, with nobody but Buffon to beat, really showed his limitations as the season progresses. The way the match played out, it felt that despite the lackluster play from the midfield and the attack, Milan could have still found something to take from it. Mihajlović subbed in Luiz Adriano and Keisuke Honda for Niang and Kucka respectively. Yet, neither provided anything, which stems from the issues in the midfield. Bacca was forced to step into the middle of the field to retrieve the ball on several occasions. When your best player is forced into that position, it typically doesn’t bode well. 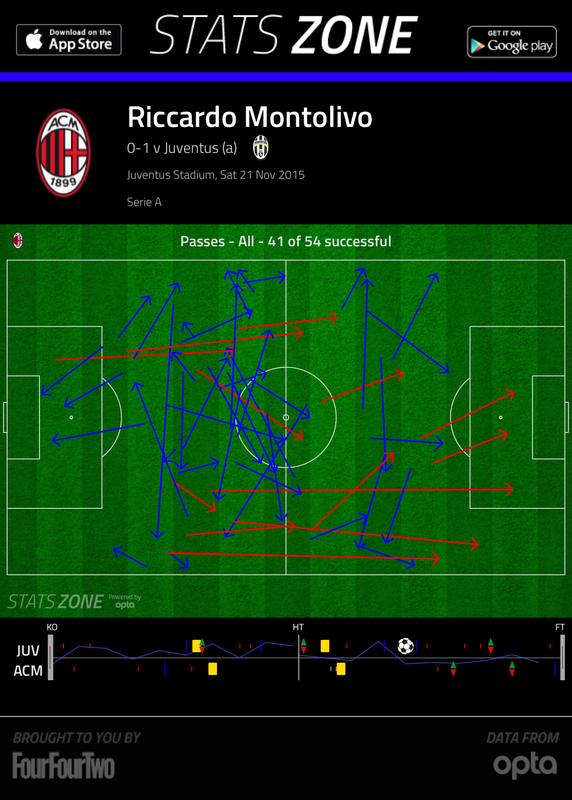 Bottom line to take from the match: Milan lacks in a lot of areas. The names coming off the bench do not invoke much fear at all. Not knocking them but Poli, Honda and Luiz Adriano just isn’t enough to make a quality impact late in matches or even if someone is in need of a rest spell. And we can see that Mihajlović is hesitant to use Suso or Mauri which is a bit odd given the sporadic ups and downs of several players on this team. Milan has to make a decision soon as to which lineup they intend on fully committing to. They currently lack the personnel to play a 4-3-1-2 fluently and they don’t have the quality wingers either for a 4-3-3. How they finish off 2015 could tell us how they intend to proceed in January when the transfer window opens. There is no sense in discussing who Milan may or may not get in January. Fact is, they need to take care of the upcoming opponents. Force the hands of Galliani and Berlusconi to pursue an Axel Witsel or Franco Vázquez. Will Milan put themselves in pole position to make January moves worth while in pursuit of a European spot? It starts with Sampdoria on Saturday, who Mihajlović knows all so well. Let’s see if they can get back on track.